Select a location where you will stand every morning to greet the children. 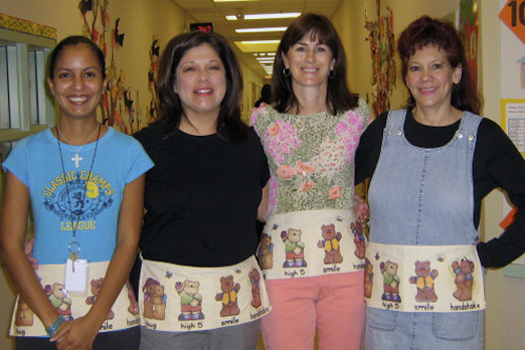 Send the verbal and nonverbal message, “Hello, I’m glad you’re here today!” Props like the greeting apron give children a choice about how they would like to be greeted. For example, you might put images of a butterfly, a hand, a bear and fireworks on an apron. Ask children how they would like to be greeted and then share a playful greeting together. (Make up greetings to go with the images.) A downloadable digital template for a greeting apron is included in the Make-N-Takes section of our Premium Resource Toolkit.